Turkish government’s crackdown against lawyers continues relentlessly. Profession of lawyer which was one of the very first victims of post-coup attempt purge has been suffering from relentless attack by executive-controlled Turkish judiciary. Lawyer Ali Rıza Küçükilhan: 12 years, membership to an armed terrorist organization. Lawyer Nedim SARU: 11 years and 3 months, membership to an armed terrorist organization. Haşim Söndürülmeyecek: 9 years, membership to an armed terrorist organization. Lawyer Hüseyin Şükrü ÖLMEZ: 9 years, membership to an armed terrorist organization. Lawyer Hayrettin AYVALI: 6¼ years, membership to an armed terrorist organization. Lawyer Mustafa FAYDALI: 4 years & 22 days, membership to an armed terrorist organization. If the given sentences are upheld by the Court of Appeal, lawyers will serve 3/4 of the given term and will be disbarred. There has been a relentless campaign of arrests which has targeted fellow lawyers across the country. In 77 of Turkey’s 81 provinces, lawyers have been detained and arrested on trumped-up charges as part of criminal investigations orchestrated by the political authorities and conducted by provincial public prosecutors. 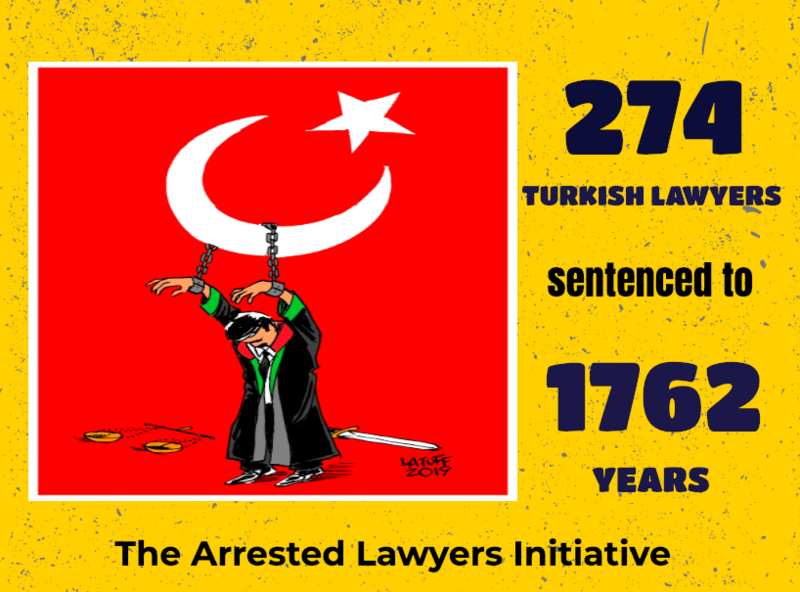 As of today, 582 lawyers have been arrested and 1544 lawyers are under prosecution, 169 lawyers were sentenced to long imprisonment. Some of the arrested lawyers were subjected torture and ill-treatment.